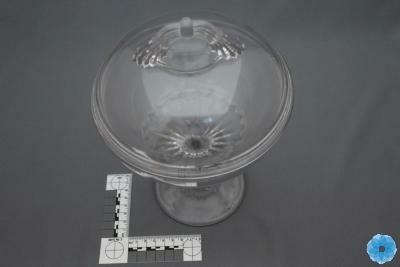 Narrative: This is part of a collection of Nova Scotia Glass collected by Verna Mae Chase nee Stronach, born March 12, 1930 in Spa Springs, County of Annapolis and Province of Nova Scotia. She married Leonard Ethan Chase on February 12, 1954 in Melvern Square, County of Annapolis. While living in the community of Centreville, Township of Cornwallis, County of Kings and Province of Nova Scotia. Verna Chase died November 4, 2008. It was her request and wish that this collection be given to the Kings Historical Society. This was carried out by her husband Leonard Chase who made the donation in her memory. 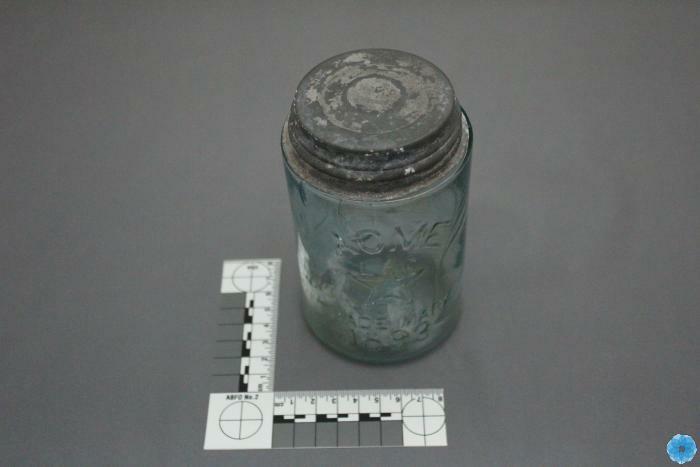 Description: Preserving jar with screw cover; one pint jar embossed on side with "MASON'S PATENT Nov.30th 1858" "ACME LG Co. TRADE MARK 1893" with a star; paper sticker on bottom "L-989 34-1"; cover is one piece metal with porcelain liner in the top; embossed on porcelain is "BOYD's GENUINE PORCELAIN LINED"; Not Nova Scotia Glass; two part mold; mold marks; bubbles in glass.